Blackacre State Nature Preserve and Historic Homestead in Jefferson County teaches guests about farming and history. 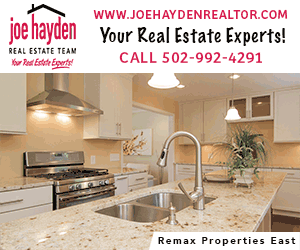 Blackacre State Nature Preserve and Historic Homestead is a beautiful, hidden gem out in Jeffersontown, KY. Blackacre is a settlement from the 1700’s that still exists today to preserve some of the history and share it with the community. 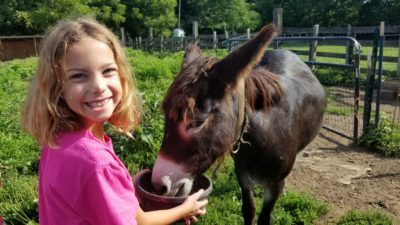 More specifically, the workers at Blackacre enjoy bringing farm animals and nature outdoors to the kids of Jefferson County who otherwise would never see a farm animal. Blackacre is home to the oldest continuously used barn in Jefferson County, and is the first nature preserve in the state. The barn was built around 1790. It’s amazing to see the huge poplar tree logs that make up the barn with cut out corners to fit together rather than the screws, nails, and bolts we use today. One side of the barn is thought to have been the living quarters of the farmer’s family, the other side for the livestock. 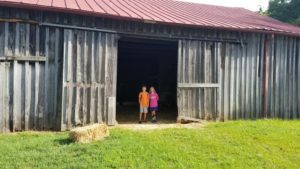 There’s a couple ladders that go up to a second level of the barn to a hay loft that my kids particularly enjoyed hanging out in until farmer Larry was ready to talk to us. 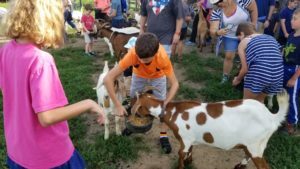 Every Saturday at 9:30am from spring through fall, Farmer Larry and the volunteers at Blackacre meet at the barn, discuss the history, farm, barn, feeding and caring for animals, and then the whole group goes out to feed the animals on the farm. Visitors are encouraged to bring apple slices, carrots, and bread for the animals. Farmer Larry provides feed, grain, bread, and other food for the animals if you forget to bring your snacks for the animals. (Farmer Larry is very good at making sure everyone gets a chance to feed the animals). We were able to go inside the goat and donkey pen to feed them, then over to feed the horses, and lastly over to the cows. All of the animals are super friendly and used to visitors feeding them. It was such a treat to pet the 3 week old goats, and have the cows gently take a slice of bread right from our hands. After the feeding, my kids and I headed out to go hiking. Blackacre has six easy to moderate trails. We hiked two of the trails, checking out a pond and a waterfall. (Be sure to use bug spray and wear long pants and hats – there are ticks and poison ivy on the trails). For Saturday animal feedings, I recommend getting to Blackacre early to wander around the barn before Farmer Larry starts his talk. I suggest bringing food for the animals, and also for yourself. There are several picnic tables by the visitor’s center in the shade. I also advise wearing long pants, sunscreen, bug spray and hats. Boots or change of sneakers are also good to bring. And don’t forget to bring water. It can get hot out on the farm and hiking trails.